Imagine a birthday party where you're the hero and we do all the work! 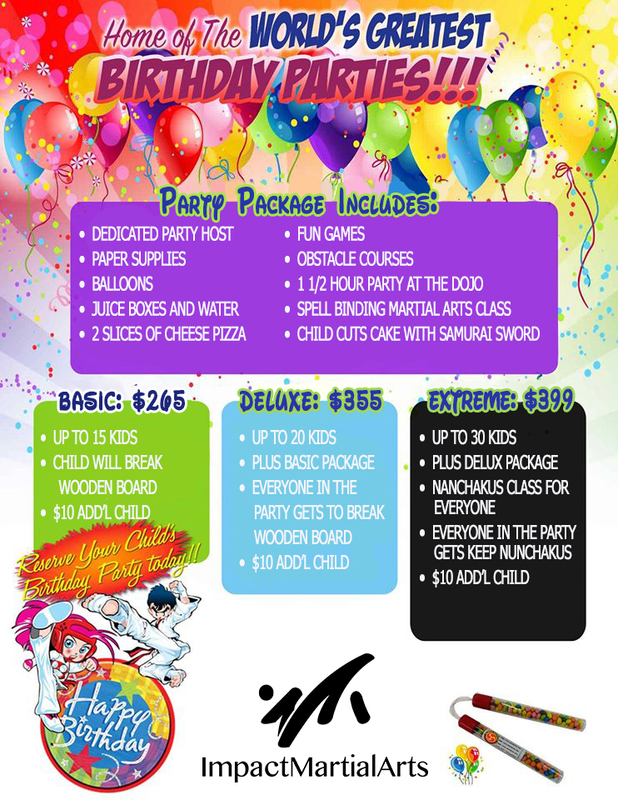 At Westchase Impact Martial Arts, planning your child's birthday has never been easier! Parents can sit back and relax in a fun and safe environment, while we take care of the children. *Parent is responsible for invitations, cake, and goody bags. You can pay $100 deposit now to secure the spot and pay rest at the end of the party. OR you can pay in full right away. Karate Birthday Parties At Westchase Impact Martial Arts!!! Before paying please give us a call 813-600-5260 or email us info@westchaseima.com to secure the date. Age 17 and under must must be accompanied by a parent or their legal guardian on their first party. First time visitors must sign a waiver at the front desk. Thank you for registering for our Karate Birthday Party! Your child is going to have a great time - it'll be fun and memorable! We emailed a confirmation for you. We look forward to see you at the party!